In the movie, “Back to the Future,” Michael J. Fox goes back in time and encounters his parents as strangers when they were in high school. He must do everything in his power to make sure they meet and fall in love in order for him to be born. Although a light comedy, the movie still is thought-provoking, as it demonstrates the intricate network of events that dictate the course we take in life, even to the extent of being born. In the case of Palace Malice, it was a simple, but fateful, decision by Burl McBride, the trainer of the colt’s dam, Palace Rumor, that has led the son of Curlin to Churchill Downs and the Kentucky Derby. On Nov. 5, 2005, McBride shipped his 2-year-old filly Palace Rumor from his barn at Ellis Park to Churchill Downs to compete in a 1 1/16-mile allowance race on the grass, sending her to the barn of his friend Hal Wiggins. McBride had seven other horses at Ellis Park because he was unable to get stalls at Churchill. Palace Rumor had been purchased as a weanling at the Keeneland November mixed sale for $8,000, then was pinhooked the following year to the Keeneland September yearling sale, where she sold as Hip 4602 for a meager $5,000 to McBride, representing Corbet Bryant and Tim Gavin. Making the fifth start of her career in the Churchill allowance race, Palace Rumor, who had broken her maiden by 5 1/2 lengths at Kentucky Downs, rallied from 11th to finish fifth. McBride was about to van her back to Ellis Park after the race, but had second thoughts and decided to keep her at Churchill overnight. At around 2 a.m., McBride received a phone call and was told his barn was gone. A tornado had ripped through the backstretch at Ellis Park, destroying six barns. Most of the trainers had shipped out, either to Churchill or other tracks, but McBride was one of the few who still had horses there. Of McBride’s seven horses, three were dead and four were so badly injured, none of them ever raced again. For a trainer with a small stable, it was a devastating blow. In a heartbeat, McBride was wiped out, except for his one 2-year-old filly who had the good fortune of having raced at Churchill Downs that afternoon and the even better fortune of remaining in Louisville overnight. Of his injured horses, one had a broken neck, one had his “shoulder ripped off,” and the other two had broken legs. For McBride, the horror was unbearable. “Bob Jackson, from Ellis Park, called me at 4 o’clock that morning to tell me my very favorite horse who was a real nice colt, had a two by four through him and they caught him running down the road with his guts hanging out, and they were gonna have to put him down. Bob also told me he had heard a cat crying in the rubble and he shined a light in there, but the walls had fallen down on these horses and all he could see were three sets of eyeballs in the dark. When they went to uncover everything, there were two horses in one stall. The wind had actually picked one horse up and put him down in the other stall and then blew the walls down on top of them. And in there with them, layin’ right next to them was my cat, Brave Heart (whose cries helped locate the stricken horses). The cat and the two horses survived, but neither horse ever ran again, they were so badly injured. In 2008, Palace Rumor was put in the Keeneland January mixed sale, where she was purchased by William S. Farish for $140,000. “We bought her for $5,000, made $111,000 on the track with her, and then sold her at Keeneland for $140,000 as a broodmare,” McBride said. 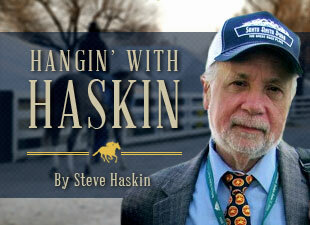 “Will Farish bought her and bred her to Curlin, and guess what they came up with? The story doesn’t end there. It was McBride, a former jockey, who took a fellow New Mexican named Mike Smith under his wing. So, of course, who will be riding Palace Malice in the Kentucky Derby? This is why racing is such a magnificent and compelling sport. For McBride, who had been training at the recently concluded Oaklawn meet, he is getting a bad case of Derby fever, and rightly so. Every time he sees Palace Malice run, he thinks back to that fateful decision and the filly that would save his career and provide him with so many thrills. “I was proud of her when I had her and I’m proud of her now,” he said. There is only thing that would give this fairy tale a proper ending.